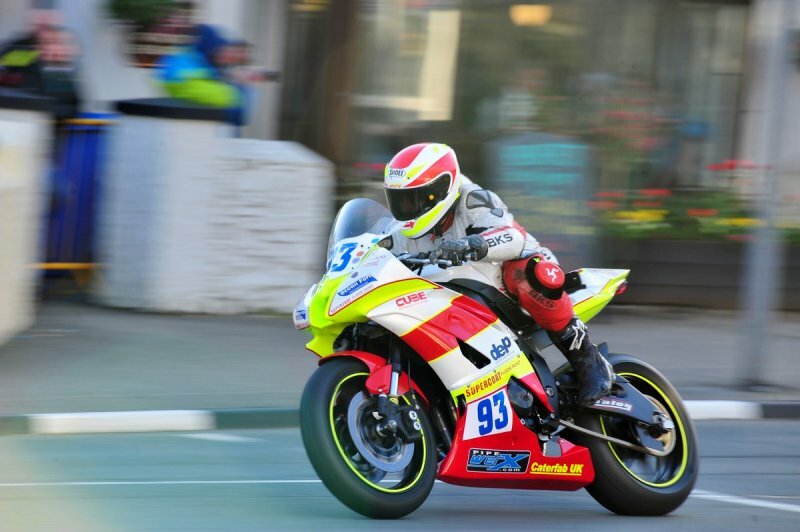 James Shipley, St. Helens, UK, on a Supersport class Yamaha 600 during a June 5, 2015 practice session, exits the tight right hand corner in front of the pubs in Parliament Square, Ramsey. Though the surface through the turn is dodgy, with asphalt patchwork, there is plenty of open runoff area should the riders come in too hot. Very few riders blow this turn, since there are hundreds of very knowledgeable racing fans closely lining the corner, just waiting to shake their heads just a bit, with wry smiles for any rider who manages to overshoot the turn. Not good for the ego at all. One odd thing about viewing the bikes at this turn, going so relatively slowly, is realizing that just a few minutes later, these same riders will be hitting close to, and over 200mph on similar narrow streets.